For the area, see Castille (area). Shaped in the battles of the Reconquista, the Crown of Castile is in fact not just one kingdom but a union of the kingdoms of Castile, León, Toledo, Galicia, Murcia, Jaén, Córdoba and Seville under the Castilian branch of the Trastámara dynasty. What remains of the Moorish presence in Iberia is now restricted to the southern kingdom of Granada, still a rich Muslim sultanate in many ways but also marred by infighting and the frequent border skirmishes with Christian raiders. Surrounded on all sides by Castilian castles it seems to be a matter of time before the Reconquista is brought to its logical conclusion and the kingdom is annexed. For now however Castile has problems of its own. The Castilian Nobles and the local Cortes of the various constituent kingdoms still hold a large degree of power and many Trastámara kings have found themselves at the mercy of the estates of their kingdoms. Factions acting entirely out of their own interests have not shied away from supporting foreign pretenders from Portugal and Aragon in the past. If the kingdom can be united by a strong ruler, and the Reconquista completed, Castile will have a fearsome military force in its hands with a long tradition of fighting for the expansion of the Christian faith. While Castile lacks the seafaring tradition of neighboring Portugal they have just as good access to the Atlantic Ocean and the new trade routes that are opening up to the west and south-east. The kingdom of Castile in 1444 is the largest and most influential country in the Iberian peninsula, bordering Portugal, Aragon, Navarra, Granada and (indirectly) Morocco, Tlemcen, England and France. It is one of the recommended country starts for new players. Historically, Castile joined with Aragon in a personal union to form Spain and went on to establish a massive colonial empire in the Caribbean, Mexico and South America. In Europa Universalis IV Castile is well-positioned to be a major player in politics both in Europe and around the world. Castile's missions focus on completing the Reconquista against the Muslim state of Granada and expanding into the New World as it did historically. Between 1450 and 1530, if neither Castile nor Aragon are vassals and the monarch of one of them is male and the monarch of the other is female (or one of them has a regency), then there is a high chance of this event happening. After it fires Aragon will enter into a personal union led by Castile with a -50% liberty desire reduction. If both Castile and France own provinces in Italy between 1490 and 1590, they will be able to claim each other's lands, reflecting the Italian Wars that consumed the attention of these two rivals in this period. This event will lead to worsened relations between the nations and a greater likelihood of war. Between 1550 and 1650, if Castile has a marriage with Portugal, and neither are subject nations, both have the same religion, and Portugal has a regency, then there is a chance of this event happening. Accepting will have Portugal enter into a personal union under Spain. If the Holy Roman Emperor refuses the land from the Burgundian Inheritance or has less than 4 non-colony provinces, Castile or Spain will get the event (if they have more than 6 non-colony provinces). If both Castile/Spain and Austria rival France, France rivals both back, and Castile/Spain and Austria do not rival each other, Castile/Spain can gain a Habsburg heir. Castile/Spain and Austria must have a royal marriage, and Austria must have a Habsburg ruler. Castile's only non-generic decisions involve forming Spain. Spain can be formed either militarily, by conquering and coring most or all of Aragon, or diplomatically, by integrating Aragon if it is a vassal or junior personal union partner, which is likely due to the "Iberian Wedding" event. Castile starts in a strong position at the western end of the Mediterranean Sea in 1444, poised to play a pivotal role either in the New World, in colonization and trade, or in the politics of the Old World. Castile's historical friendship modifier with Portugal (+25 relations bonus) means that it usually only needs to worry about rivals and attacks from one direction and makes it easier to get an alliance that can potentially last the entire game. Due to its position Castile can be a good country for a beginner to learn the basics of the game, such as colonization and trade, while staying relatively insulated from major wars. For an experienced player, Castile offers a powerful set of ideas that can be leveraged to make it a formidable power both in the Mediterranean area and around the world. This guide will be written largely for a new or inexperienced player, with some more advanced options at the end. Castile is in a prime position for colonization and receives great bonuses to doing so in its national ideas, making Exploration ideas an excellent first choice. While waiting for the first idea group to be unlocked, there are several things to occupy Castile in the Old World. Navarra, the single-province nation to the north of Castile, is a prime candidate for vassalization. If Castile does not do it France or Aragon is almost certain to, and one or both of them are likely to be Castile's rivals. Vassalizing Navarra requires increasing their opinion to +190 faster than France or Aragon can; giving gifts or subsidies along with improving relations should make it easy to do so. Navarra can be easily annexed after ten years, freeing up a diplomatic relations slot for other things. It can also be given French provinces should war break out between France and Castile, allowing more land to be taken with less aggressive expansion when it is annexed. 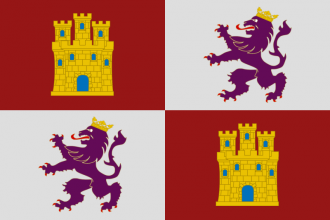 If Golden Century is enabled, vassalizing Navarra will give Castile a free castle in the province. Castile has the early mission Reclaim Andalucia for conquering Granada early in the game. If Portugal has been allied, this should prove to be an easy fight, even if Granada has managed to ally Tunis or Morocco (if they have, taking some additional land in North Africa will help the player get a head start on completing the Continue Reconquista mission, and the long time to convert the Sunni provinces can be avoided by expelling minorities to your colonies). Finishing the Reclaim Andalucia mission will cause the "Fate of the Kingdom of Granada" event to happen. One option in this event will covert all the provinces in Andalucia to the Catholic Religion and Castilian culture, instantly allowing a player with Golden Century to complete the Convert Iberia and Expel the Moriscos missions. Aragon will likely rival Castile, and is large enough to be a threat, but due to the possibility of the Iberian Wedding event happening between 1450 and 1530 and possibility of getting Aragon in a personal union it is advisable to avoid war with Aragon where possible as long as the event has a chance to fire, as getting Aragon in a personal union and eventually integrating it will be vastly less trouble and cost less administrative power than conquering it by force (if war is unavoidable, not taking provinces in peace deals in favor of other reparations might be a good idea). If it is later than 1530 (and thus no chance of the event firing) and the event has not fired, there is no further reason not to conquer Aragon militarily. Due to Castile's size and bonuses from its national ideas, Castile usually generates a significant amount of Papal influence. This can be used either to attempt to become the Papal controller, or on any of the variety of bonuses that Papal influence can be spent on. If Castile does become the Papal controller, Excommunication and Crusades may be used to further Castile's interests. Expanding into the Maghreb region of northern Africa, although costly in administrative power due to Berber national ideas increasing coring cost, will allow Castile to draw more trade value from the Safi node. It will also generate little to no aggressive expansion with most European countries, due to the invaded countries being Muslim. If Castile has managed to become the Papal controller, calling a crusade against a target here can make wars against them easier. If conditions are favorable and a good alliance network can be constructed, attacking France early may be useful to help limit its power and prevent it being as big a threat later on. Allying England can be helpful for this, along with either Burgundy or Austria. This is not necessarily recommended for a new player, as France is quite tough. However, if France can be beaten (by a group of allies working with Castile), taking land along the Mediterranean coast in the Genoa trade node will let Castile earn more ducats in that node later. Alternatively, France can make an excellent ally against England, Burgundy, Aragon, and Austria, some or all of which tend to rival both Castile and France at some point during the game. Completing the Italian Ambition and Italian Conquest missions can be much easier if the Big Blue Blob is on your side. Once Exploration ideas have been taken, Castile can begin to expand into the New World, or into sub-Saharan Africa and around the cape into Asia, if so desired. If Portugal hasn't colonized Arguin it makes a good stepping-stone to increase Castile's colonial range. From here, it should be possible to reach provinces along the Ivory Coast in Africa, in Brazil in South America, and possibly in the Caribbean. Any of these are excellent choices and can help steer trade money into the Seville node, though if the El Dorado DLC is active it would be prudent to see where Portugal is colonizing in order to avoid incurring the significant penalties for breaking the Treaty of Tordesillas. At this point it may be a good idea for Castile to focus on either the Old or New World rather than dividing its energies between them. If focusing on the New World, new colonies can be used as stepping-stones to reach further locations for colonization. Grabbing valuable trade provinces (such as estuaries or Centers of Trade) will help steer trade money back to Castile's coffers, and can serve as the basis of future colonial nations. Conquering the gold-rich nations in South and Mesoamerica will also increase income. When colonizing, the trade flow is important to keep in mind: provinces on the eastern coast of North America and in Canada will not provide any trade power to nodes Castile owns (unless Castile has expanded into the English Channel node), and are therefore much less useful than those in the rest of the Americas. If El Dorado is active, colonial nations with at least 10 provinces will provide Castile with an extra merchant, who can be placed to transfer trade in various nodes in the Americas starting with the Caribbean and working back to where Castile's colonial nations are located. It will also allow colonial nation who own gold-producing provinces to periodically send treasure fleets back to Castile for a moderate amount (typically ~100) of ducats. Expand or continue expanding into northern Africa, perhaps even challenging the mighty Ottoman Empire for the rich provinces of Egypt, or even the Holy Land. Expand into central or sub-Saharan Africa, which will provide lucrative trade goods such as slaves and ivory, and usually little resistance. Go to war with France in order to keep it from growing too large and posing a threat. If Aragon is in a personal union with Castile, integrating them into Castile and forming Spain is a good goal. Aragon can be immediately integrated into Castile and Spain formed by decision, as long as the conditions are met. Due to the lack of the usual Diplomatic point cost, expanding with Aragon is a good strategy. However, it should not be given more than 31 provinces or the decision will no longer be available. If Naples is also in a personal union, integrating them will give a significant foothold in Italy, perhaps allowing an expansion into the rest of Italy (though taking Rome from The Papal State should be avoided to avoid taking significant penalties for holding it) or even the Balkans. Further colonization and conquest in either the New or Old World, to continue bringing foreign ducats into Castile's treasury. Once Aragon is integrated, it is a good idea move Spain's trade port to the rich Genoa node (especially if more Trade Centers such as Provence and Lyonnaise have been taken). For experienced players who can make best used of Castile's position and national idea bonuses, Castile offers some additional options. By rivaling Portugal, England, and either Aragon or Burgundy at the beginning of the game and allying with France it may be possible to take provinces from both England and Portugal in one war, as they begin the game with an alliance. Signing separate peaces will allow taking more land, and annulling treaties between Portugal and England will be helpful in the future. Forcing England to release the country of Gascony after forcing the return of the province of Gascony to France will result in the newly released country being a single province and willing to be diplomatically vassalized. When the truce with Portugal has expired, it can be attacked and hopefully vassalized. This may require a second war depending on how much was taken in the first peace and whether they have been attacked by Morocco or not. If Morocco has taken Portuguese land, they can be attacked and forced to return Portugal's cores. Vassalizing Portugal allows for more control over the Sevilla trade node, and doing so after they have committed to the Exploration and/or Expansion idea groups allows for even more rapid colonial expansion. Continue advancing into France and feeding Gascony. France is one of the four major colonizers, so crippling them can free up more space for Castile. Expansion into Italy can be undertaken, especially after northern Italian nations leave the Holy Roman Empire around 1490. Castile can try to become the Holy Roman Emperor, by either improving relations with and allying the Holy Roman Electors or vassalizing them (though beware of coalitions forming due to the increased aggressive expansion in the Holy Roman Empire). Similarly to France, England may be attacked in order to keep it from colonizing, leaving the New World to Castile and its vassal Portugal. By the mid-1500s Castile should be able to have control of most of France, North Africa, and Italy, with near complete control over the Genoa trade node. Ideally, Castile's ruler is also the Holy Roman Emperor and the Burgundian Succession has fired, leaving Castile in control of some of the highest development provinces in the world. After this point there is really no guessing how the world has turned out, but Castile should be in a strong position to go on conquering throughout Europe or around the world, or even attempt a World Conquest. Good luck! This page was last edited on 22 February 2019, at 09:28.